The story begins when a jester, Dhoulmagus, comes to Castle Trodain and steals the King's sceptre. He then uses its power to turn his majesty into a troll, the Princess into a horse and the castle inhabitants into plants. The only one left unscathed from this attack is a castle guard who escaped the curse and must now step up to save the kingdom he's sworn to protect. Only by traveling the lands, recruiting allies and following the trail of destruction that Dhoulmagus leaves in his wake will The Hero be able to retrieve the sceptre in order to restore Trodain back to its former glory. Nintendo's press release also outlines some extra goodies, which we've summarised below. Additional side quests and dungeons. New story content "that will provide more back story about The Hero and the villainous Dhoulmagus". Full voice acting in plot-important cutscenes. Take 'photos' at any point outside of cutscenes or battles, adding stickers, poses or filters. Share them via StreetPass. "Once the player meets Cameron Obscura in Port Prospect they'll also be able to unlock Cameron's Codex, where they'll be rewarded for taking pictures of certain subjects, monsters and situations." We loved the recent DQVII release, so naturally have high hopes for this. How many of you are planning to pick this up? Will triple dip to show support. Thanks for the localization Squeenix! @binaryfragger reminded me that I have the original formats too. So one could assume the EU release isn't going to be too far away? Still playing through DQVII, nearly finished now. In some ways, I hope this isn't quite as big hahaha. Dang I still need to get VII! .....annnnnnnnd I want this too. I hope it will bring visibility to the franchise, and not fatigue ! I have this on PS2, but I haven't played it yet. I'm getting this for the new content and enhanced visuals. Can't wait, always wanted to try this one. I just got VII and Builders and have no time to play either. Too soon Nintendo! Got it on PS2 but never finished as younger me was scared by the monsters. Definitely getting this and I'll play both eventually. Also have the (meh) android version, soon I'll have every version of it. Here's hoping it comes out the same day in Europe, it's right after my birthday. Same day as Europe which was just tweeted by NoE. Gotta release them all before Switch I guess. Cool! Glad to see this classic coming soon. I'm sold. One way or another these gaming companies manage to take my money. My absolute favorite of the series. It has a great story.You fall in love with characters. It also has alchemy. This one is way better than DQ7. A must have. I wish it was coming to the Switch instead. If I manage to beat VII by the 20th then I will gladly pick up VIII. VII is my first Dragon Quest game and I'm really loving the amount of dialogue for almost every little thing you do. This is the DQ game I'm really looking forward to since I started to play it on the PS2 but never got a chance to finish it. Wow, guess it's a good thing that I went ahead and got VII instead of waiting in order to focus on other games. The games just keep coming. I still have my PS2 version, and I don't particularly feel the need to get this version. However, if you've never played it before, I highly recommend it! It's arguably the best DQ (or at least one of the best), even if it lacks the customization of 3, 7, 9, and 10. The story of 8 is far more cohesive and enduring than that of 7. Too bad the 3DS box art didn't correct the mistake of the PS2 box art, by missing Angelo again. "Enhanced visuals"? Did they change it before release because I remember in previews the graphics were downgraded from the PS2. YES! My all time favourite game! I cannot wait! Although I've never played a Dragon Quest title, this one looks very good and I might get it around launch date. I have it on PS2. I'm not really keen on re-buying games I own in perfect working order so I might pass. Third ending though and the new touches might make me change my mind later. I have it preordered, but I still have to get through DQ V, VI, and VII before I play it. At least it won't add to my backlog (currently 198 games), because the PS2 version is already on there (same situation as DQ VII and the PS1 version before the 3DS version was released). Still have my ps2 version in working order but definitely double dipping. All I been playing is 3ds titles lately. I'm enjoying 7 currently and sun/moon come out soon. I'll be good and ready for when this releases (hopefully)! 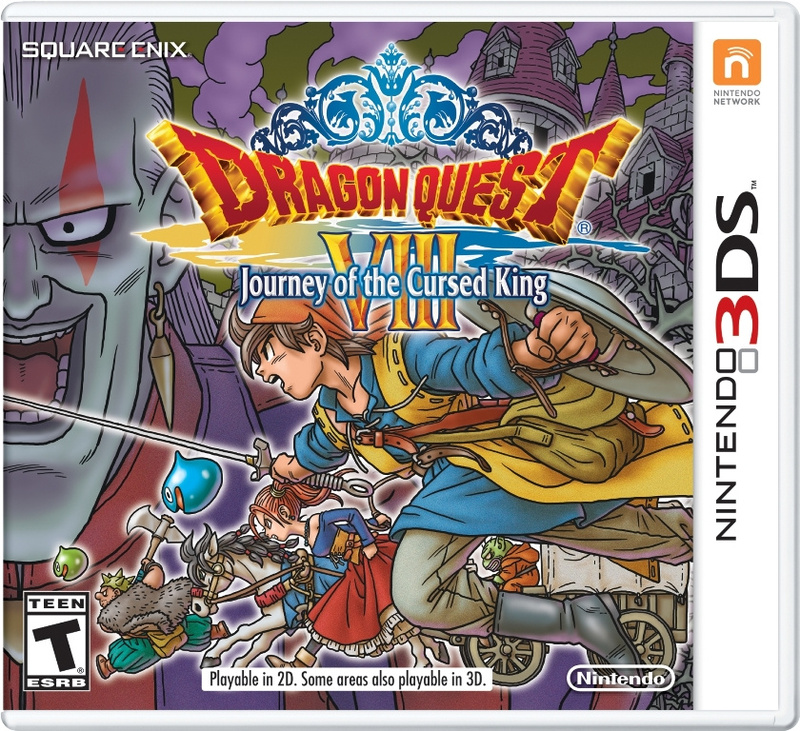 Already have this preordered, almost done DQ 7 and can't wait for this game to come out. Should have it done before DQ8 comes out. It's a great game (understatement) and I might buy it, but I'm not happy about how the outfits have been toned down. I don't think it'll be censored in localisation, but what they already did for the Japanese version was unnecessary. I want to get it for the new features, but am thinking about getting the Android version instead. forgive me ignorance. but story wise, should I play VII before I play VIII? and are there any story connections before VII and after VIII? I've only played I thru III back in the day. Are DQ games all standalone? Do they take place in the same universe? Do I need to play anything prior to this one? I'll be picking this up at some point. A former coworker of mine is a huge DQ fan, and VIII was one of the games he recommended a newcomer like me to start with. I've always been intrigued by the series, but have never played any of the games. I just did some research - it looks like VII and VIII aren't connected and VIII is standalone. Wow that is so soon, I haven't even completed the PS2 version yet. Glad it'll be out after the holiday otherwise I wouldn't had any money left to get this. "so soon, I haven't even completed the PS2 version yet"
An eventual series support get, but not right away for this one even though VIII is the best in the series. I still love the original PS2 version so much! I doubt I'll be done with VII by then, but I'll likely pick it up eventually. Much sooner than I was expecting, Jan/Feb are crowded with JRPGs, so this might sadly have to be put on the back burner for me, though I'll still buy it day one to support the series. Looks like I need to pick up the pace and finish 7. I may be done with VII by then. Awesome. I've been waiting years for this, I would have thought the marketing would have been a bit more tbh. I'm definitely getting this. Big DQ fan and Fragments of the Forgotten Past is great. DQ 7 did well, and if this does too then we could be getting way more DQ games in the future. I had known very little of this franchise, as most Europeans. But DQVIII was a revelation. It's use of assets may have been quite economic compared to the big hitters of the time, but boy did it not lack heart and beauty. @JaxonH Recently I had being playing too much RPGs on the PS2, it just so happens that I just started Dragon Quest VIII last Summer and still not complete it yet but I will buy the 3DS port to play it again on the go. Well If Squeenix is trying to increase hype for XI it is working on me. Great news in which this gives me enough time to finish DQVII. Does anyone know how DQVII has sold? Hopefully well and now SE is trying to capitalize on a successful localization and get us to buy another game. I have learned that sometimes its advantageous to buy the games I know I want to play so I can play when I want. DQVII was sold out on amazon for a while and the local EB Games I often buy from sold out, too. DQ games on the DS became rare after a while. Pick it up if you want it and play when you can. Let's hope this doesn't get bundled with a Final Fantasy game demo. For people who are getting this because they want to start in the series or never finished the ps2 version here is what you need to know the 3ds version is supposed to be fan service, not that is a bad thing but this and the ps2 version will give each a different experience, the graphics on the ps2 version are not that colorful it gives more a sober vibe, the houses and the trees feel more remote from each other, and also random encounters which added a lot of pressure in the gameplay it basically forced you to heal before going on a route or entering a dungeon, the 3ds version will have more content than the ps2 version but graphics are lot more colorful more child friendly, every object is more restricted so that you can see everything on a tiny screen and also you will able to see monsters outside which means no random encounters. "[Update: this is also confirmed as the European release date, too]"
Well, it's settled then, I know what I'm getting in January! I tend to get worried jumping into a series wondering if I am supposed to know something story based. Jumping into Xenogears, Suidenken, Star Ocean, even the later Grandia titles always scared me a bit worrying that I already missed something. Anyone notice that Angelo is the same voice actor as Alvis in Xenoblade? I hear ya! I feel let down by all the fire emblem games the US didn't get... or Shadow Dragon DS, which is only half of the full story that JP got.